IrisVision has created a low-cost visual aid system for people with low vision. 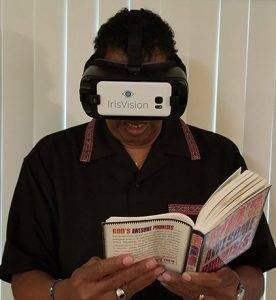 This high-tech invention uses a Samsung Galaxy smartphone mounted in a Samsung Gear VR headset. The phone will capture a scene, and then enhance the image for a person with low vision. The visual enhancement is done through a series of algorithms. The invention can allow for different color contrasts, zooming modes, and reading modes. The system is aimed to help people with low vision gain their independence at a low cost. Please view this article to learn more about the product, and please contact us at 702-906-2587 to discuss if this is the right product for you.